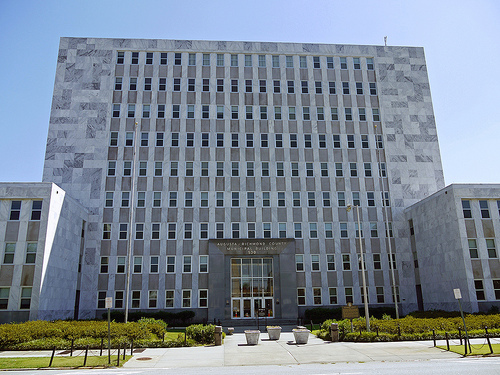 Augusta Commissioners wisely tabled the latest management proposal between the city and Augusta Riverfront LLC for the $12 million taxpayer financed Reynolds Street parking deck at yesterday’s commission meeting. The nearly 100 pages of legal documents were dropped in commissioners laps at the last minute as they were coming back from a Georgia municipal conference in Savannah. Several commissioners said they needed much more time to review the documents before voting on them. At yesterday’s meeting, Commissioner Jerry Brigham, made a motion to send the documents back to a Finance Committee work session for review. His motion was seconded and easily approved. Lori Davis, a contributor to CityStink.net, had tried to get on yesterday’s meeting agenda to speak in opposition after learning last Friday that the parking deck contract would be up for approval; however, by that time the agenda had been conveniently closed out. Davis was at yesterday’s meeting nonetheless as a citizen observer. The citizen activists from Augusta Today, like Lori Davis, must consider yesterday’s vote as a delayed victory. Mrs. Davis and Al Gray urged commissioners to reject a similar agreement back on February 7th, but Commissioners went ahead and tentatively approved the parking management agreement with the proviso that the $7 million worth of liens would be released on the property that the deck sits on and the land would be transferred to the city’s Land Bank. After Bowles’ remarks, Augusta Riverfront LLC , their lawyers from Hull Barrett, and city administrator Fred Russell went into damage control mode. The lawyers quickly cobbled together nearly 100 pages of documents for a new management contract for the parking decks, and said that there was an agreement in place with Wells Fargo to release the liens. However, upon closer inspection, Wells Fargo was actually only agreeing to a partial release of the liens, maintaining a security interest in the $12 million taxpayer financed parking deck. What that means is that if 933 Broad Investment LLC defaulted on their $7 million loan, Wells Fargo would become the operator of the deck, and would get all of the revenue from the 160 ground floor spaces. Also, when we put the latest management agreement under the microscope, we found that the terms amounted to a blank check for Augusta Riverfront LLC with no accounting controls and a nearly unlimited revenue stream to ARLLC courtesy of Augusta taxpayers. To put it in the simplest terms: It was a BAD Deal! But it should have been no surprise that this deal was so lopsided in favor of Augusta Riverfront LLC, since it was crafted by their own attorneys from Hull Barrett. Where was city attorney Andrew Mckenzie and city-hired outside counsel Jim Plunkett in all of this looking out for the interests of the taxpayers? Why would a management agreement totally crafted by the attorneys for the other parties even be placed on the commission agenda by city administrator Fred Russell? And why was this all done in such haste giving commissioners little time to review the volumes of documents and denying the opportunity for citizens to speak out in opposition? Cost Recovery Accounting Specialist Al Gray, who is also a contributor to CityStink.net, developed a matrix comparing the latest contract proposal with Augusta Riverfront LLC with one that Aampco Parking Systems out of Houston, TX had agreed to earlier. You can view that matrix here–> Why is the Parking Deck Contract this Rigged? There was no comparison! The Aampco agreement was far superior to the one being submitted by Augusta Riverfront LLC. So why did Fred Russell ignore this better deal and go for the one giving a “blank check” to Augusta Riverfront LLC? Augusta Commissioners deserve accolades for putting the brakes on this very bad management deal and sending it back to committee. Particularly we would like to recognize Commissioners Bill Lockett, Joe Bowles and Wayne Guilfoyle for showing leadership on this issue and providing assistance in our investigations. 2. Use the Aampco deal as a template and swap out the deck agreements. Put in strong audit rights. Get all capital purchases to be made by Augusta. 3. *Condemn the land under the decks because Augusta needs to get out from under paying 23% of the costs, then rebid the deck management out. Special Report: Why is the Parking Deck Contract This Rigged? Tagged Augusta Commission, Augusta Politics, TEE Parking Deck Saga, The Outsider. « Special Report: Why is the Parking Deck Contract this Rigged?